The state Transportation Commission, appointed by Gov. 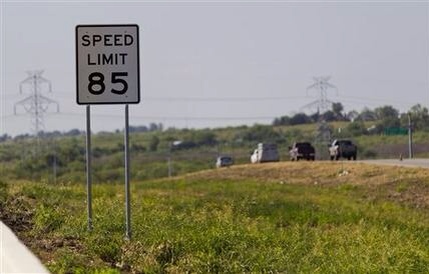 Rick Perry, approved an 85 mph speed limit for a new toll road opening this fall between Austin and San Antonio that is intended to be an alternative to crowded I-35. Some critics say that based on prior studies, the change will likely lead to more accidents and deaths on the road. The change also means that the state of Texas will receive a larger share of toll revenues — potentially $33 million more than if the speed limit was 80 or below — per the deal with the contractor that will operate the road. Patch: Do you support or oppose plans to tunnel under Beverly Hills High School as part of the Westside Subway Extension? Waxman: I wrote the Metropolitan Transportation Authority a letter about Beverly Hills High School and I said that they have to take safety as their No. 1 concern. [The MTA] reported back that they see the risks in tunneling under Beverly Hills High School but they saw greater risks taking an alternative route. I’ve looked to the experts, again, on the technology and at the MTA. They had a very difficult choice and they made the choice to tunnel under Beverly Hills High School. This will be tested further, the safety questions, in the courts. I want that question exhaustively studied. I support the system and I’ll continue to fight for funds for the system, but where the system goes is up to the MTA, not Congress. Although the SR 710 study has eliminated seven of 12 alternatives for a project to improve traffic in the area around the 710 gap, some longtime freeway opponents say the fight is not over — especially if the project becomes a tunnel. There’s almost nothing in the story about other alternatives still under study, including light rail, bus rapid transit, traffic signal improvements and the no-build option. On the 710, there’s a reason there is no focus on the transit options. The LRT and BRT options are jokes. They have a disconnected rail line from Fillmore to East LA Civic Center with elevated or underground stations where they join the existing Gold Line, and no provision as to where they plan to put these trains. The BRT option just takes the existing 762 and takes away a lane of traffic to give it its own lane. This is a Rapid Bus that only runs every half hour in the middle of the day. Meanwhile, the one bus line that might have been an alternative, the 485, was severely neutered to stop running at night and on weekends, and there are no plans to restore it back to the 15 minute service that it once had during the peak hours (it runs every 40 minutes now). Seriously Steve, as the other commenter pointed out, I don’t think anyone believes that the Metro is going to choose the other options. Just as everyone knew (and Molina said with her line on the map) that F-7 was going to be chosen. The “process” and the numbers are for show only. And Metro can make them show whatever they want them to show. Something I learned in class from Salvucci himself (the man behind the Big Dig). The problem with anything that has to do with transit related issues is that it’s always single sided. Metro has all the monopoly in deciding things. There is no competition available. Metro can give out 710 ideas, but all their ideas will be for the benefit of Metro and they can adjust and manipulate the choices so that the public can be persuaded anyway they please. We’re a free country that supports competition. We need a private enterprise solution that comes up with better ideas and alternatives than Metro. Metro can give out their options, well why not a private company to provide their own solutions? We need more choices. Metro can provide options A, B, and C, well let also private enterprise provide their options A, B, and C.
Of course Metro will never be for this idea because they know private enterprise works better and it will be a nail in the coffin for taxpayers supporting Metro. You raise some valid points, but the Munis do provide some competetion to LACMTA, even if they are officially feeder agencies. In Orange County, there is virtually no municipal transit. Irvine has the i-shuttle, Anaheim has bus lines in conjunction with the resorts, and Laguna Beach has their shuttle. But these have nothing to rival, Big Blus, Culver City, Long Beach Transit, etc. Except the competition are also other government agencies. How is that supposed to help taxpayers when government agencies aren’t working together and instead, fighting each other for political gains? For real competition to be done, it has to be done fair game: private enterprise versus municipal transit agencies on a fair level. We do not have that because of stupid laws and ordinances that protect municipal transit agencies’ monopoly in running public transit. No one, except municipal buses, can pick up passengers from bus stops. That hinders any form of private mass transit to ever take shape. If so, why do you think the City of LA bans taxis (an example of private enterprise) from picking up passengers off the streets and bus stops like NYC? Why do you think when you hail a cab from the streets in LA, you land yourself in jail and face a huge citation? Perhaps we should have more private transportation, but I don’t see competition among public transit agencies as a “failure to work together”. It can reward efficiency. I don’t want different agencies trying to put each other out of business, but there is some overlap between LACMTA, Munis, Metrolink, and Amtrak. E.g., whether they deserve it or not, BBB has gained a positive reputation. If Culver CityBus, LACMTA, and LADOT ignore this they could lose ridership on the Westside. It’s all of a political game than serving the needs of the public. Metrolink and the SMBBB is STILL isn’t using TAP. Metrolink uses distance based fares, everybody else uses flat rate fares. It’s a $1.00 per ride for the CCB whereas it’s $1.50 per ride for Metro. There is absolutely no consensus or standardization going on that the whole thing is a mess. Everyone is free to make up their own rules and policies. It’s like saying it’s 9:00 AM in Downtown LA but over in West LA it’s 10:00 AM. And they expect people to memorize all this? It’s like people need a “how to ride public transit in California for dummies” manual just to figure out how they all work in various parts of Southern California. You know in most cities around the world, they have it simple: a totally integrated fare structure under regulated distance based fare policies. All the heads of the transit agencies in California needs to be locked up in a single room and refuse to come out until they come up with a single standardized solution of fare policies, rate structures, and tap-in/tap-out technology.